In Real Life sounded just like the cute read I needed. I mean online best friends falling for each other and meeting for the first time? So cute! However, it wasn’t executed as I hoped it would be. While this book was cute, it was just a little bit too much for me. First of all, this book fell into the missing parents cliché all too easily. I get that it somehow needed to be done in order for Hannah to get to Las Vegas, but I still didn’t like it. Also, the whole just wandering around Las Vegas concerned me. I guess I just couldn’t relate to any of the characters well. Hannah was an okay main character for me. I really did want her to get with Nick, but I was still sort of frustrated with how she went about it. I admit it, Nick’s girlfriend could be annoying at times, but so was Hannah. Really most of the characters frustrated or annoyed me at some point in the novel. Also, most of the drama and the problems they faced could have been solved rather easily if they were just honest with each other and talked about it. Another part that bothered me was Hannah’s sister and best friend. I felt like they should have supported Hannah more instead of going off on their own. I just don’t think they were the best of influences on Hannah. What I did like? The romance at the end. It was really cute how Nick and Hannah finally got together. Even though I guessed early on part of Nick’s secrets, it was fun to see it revealed to Hannah. And I was swooning over the cuteness when they did get together. 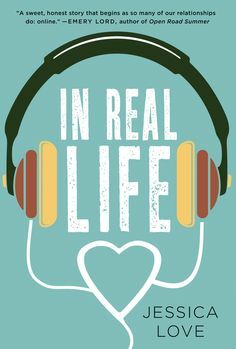 Overall, In Real Life is a pretty light-hearted, easy read. Would I recommend it? Maybe. I guess it depends what kind of mood you’re in for and if you like cheesy, rom-coms. It was definitely very cute! I hope she (or you) will like it when/if you end up reading it! Well, good thing I didn’t request this back then! By no means was the book terrible, but there just quite a few parts that annoyed me. Thanks for stopping by!